Trying to find some perfect ZZZZZs near Oklahoma City? We’ve done some research to help you find the best new mattress at the lowest prices. If you’re tossing and turning at night, waking up groggy, or experiencing back pain, it may be time to buy a new mattress. The National Sleep Foundation recommends replacing the average mattress every 8 years, though most Americans hold onto theirs for 10 years or longer. In addition to the cost of buying a new model, many of us put off buying a mattress because of the inconvenience- finding a local store, deciding on your budget and comfort preferences, and selecting a model can be a long process. Fortunately, our list of the best places to buy a mattress in Oklahoma City can help simplify your shopping process. We’ve combed the local listings and reviews for each neighborhood to bring you the top picks in each area of Oklahoma City. Read on, and discover a mattress store that fits your preferences and budget, right in your neighborhood. 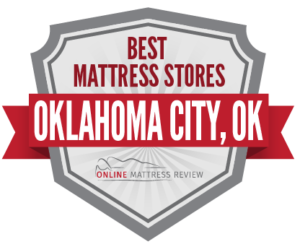 Right in downtown Oklahoma City, you’ll find one of the city’s highest-rated mattress stores, Oklahoma Mattress Company (915 NW 4th St). This locally-owned mattress shop boasts an impressive average Google rating of 5-stars, and has been in business since 1913. The store sells high-quality innerspring, latex, and memory foam mattresses, and also builds custom mattresses to order. Oklahoma Mattress Company offers low-cost delivery and free recycling of old mattresses. Another centrally-located mattress store is City Mattress (2500 W Lindley Ave). City Mattress is a family-owned store which has been in operation since 1945, and creates their own cotton-filled, tufted, innerspring mattresses right in their Oklahoma City-based factory. In addition to innerspring models, City Mattress carries memory foam and latex models, as well as adjustable beds, toppers and bedding. Shoppers give top reviews to this mattress shop for customer care, including an extended warranty on their mattresses. Finally, The Mattress Store (3609 NW 10th St) has an impressive 4.7-star average review, and customers praise the store’s responsive and knowledgeable staff, as well as the shop’s reasonable prices. Mathis Sleep Center (3400 W Memorial Rd) has also earned excellent reviews. This mattress shop offers a wide selection of mattresses, box springs, adjustable power bases, and sleep accessories. Among the popular brands available are Tempur-Pedic, EcoComfort, Lady Americana, Sterns and Foster, and Serta. Mathis Sleep Center offers free delivery, a 1-year comfort guarantee, and a lowest-price guarantee. In addition to mattresses, this local chain also sells including living room furniture, bedroom furniture, dining sets, dining room furniture, and recliners. Another top-rated mattress store in northern Oklahoma City is Mattress Firm (2220 W Memorial Rd), which has a location in the Quail Springs Marketplace. This large chain is the nation’s #1 mattress retailer, and their Quail Springs location has earned an incredible 5-star rating on both Google and Yelp. Reviewers frequently praise the store’s wide selection and knowledgeable sales associates, who are highly trained in diagnosing sleep preferences and problems, from ideal temperature and firmness for each body, to determining positioning that can improve sleep apnea, insomnia and back pain. Shoppers appreciate the staff’s expertise and no-pressure sales tactics, as well as the store’s sales policies. The store also has a 120-day “sleep happy” guarantee. During this time frame, mattresses may be returned or exchanged, and Mattress Firm will refund the difference if a customer finds the same product offered at a lower price. The Mattress Place (1339 SW 59th St) carries top brands like Simmons Beautyrest, eco-friendly bamboo mattresses by Cariloha, and economy models like Sierra Sleep by Ashley, as well as Instant Comfort dual-adjustable air mattresses and massaging bed bases. Further south, Mattress Discounter (8203 S Pennsylvania Ave) carries highly affordable mattresses at every price point. The store sells deeply discounted luxury brands like Tempur Pedic and Pure Bliss Talalay latex mattresses, as well as popular brands like Sealy, and their own line of economy mattresses, Promenade. Mattress Discounter also stocks adjustable air mattresses by Instant Comfort, and a wide range of massage chairs and bedroom furniture. Customers can take advantage of a 90-day comfort exchange policy to swap out models if needed, and the store’s frequent sales and special promotions can result in additional savings. Mattress Supercenter (2127 W Interstate 240 Service Rd) also specializes in affordable mattresses, and stocks popular brands such as Serta, Sealy, and Tempurpedic, along with a wide array of pillows, mattress protectors, and bedding. Mattress Supercenter also claims to have the largest selection of adjustable bases in the State of Oklahoma. Customers give positive reviews to the shop’s “sleep experts,” who assess each shopper’s comfort level, spinal alignment and pressure points to guide them to the right model. Shoppers looking to buy a mattress in west Oklahoma City have fewer options that those in other parts of the city. One mattress store in the area is Mattress Mart (4705 SE 29th St), where customers report the staff to be friendly and the prices to be reasonable. The store stocks a range of bedroom sets and other home furnishings as well. Further South, payless Mattress (4600 S I-35 Service Rd b) is an excellent destination for those in search of a highly affordable name brand mattress. The store specializes in closeout models, and offers discounts of 50% of the original price on brands like Sealy and Sterns and Foster, high-end options like gel memory foam, as well as beds, bedding and adjustable bases. There are a number of mattress stores in East Oklahoma City. The aptly-named Mattresses and Furniture (1415 S Council Rd) is a massive retail space which sells a wide array of furniture and home goods, along with mattresses in a variety of sizes and styles, including Euro Top, Pillow Top, and Tight Top. Mattresses and Furniture stocks mainly economy brands, with high-value options like Coaster, Golden Mattress, and Simmons Beauty Sleep. Mattress Firm has several locations in the area as well, including one in Westgate Marketplace (6301 SW 3rd St), and two Mattress Firm Clearance locations (4139 W Reno Ave, 3550 W Reno Ave). Those interested in a waterbed or futon can check out a wide and affordable selection of each at Brown’s Beds and Futons (404 N Rockwell Ave). The store also stocks traditional mattresses in memory foam, pocketed spring and pillow top models, made by Corsicana. This locally-owned mattress shop has earned a 5-stay rating on Yelp, where shoppers give high marks to the friendly, helpful and laid-back sales staff.